Mary Ann Lee was born in Philadelphia and made her ballet debut, probably as a young teenager (her birth date is uncertain), in 1837. During her career, she performed around the country and went abroad to study at the Paris Opéra. 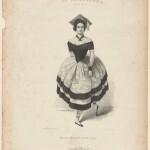 Upon returning to the United States, she toured with fellow Philadelphian George Washington Smith and danced with him in the American premier of Giselle in Boston. Here, she is depicted in the ballet La Smolenska. George Washington Smith is often considered America's first male classical ballet dancer. A native Philadelphian, Smith was inspired by and later invited to dance with the famed Fanny Elssler. He toured in a small troupe with fellow Philadelphian Mary Ann Lee and he enjoyed a long career as a teacher and choreographer. This souvenir trade card from November 1876 shows Smith’s staging of The Black Crook at the New National Theater in Philadelphia. This watercolor painting by artist David Johnson Kennedy depicts the Chestnut Street Theatre as it stood in the first decades of the nineteenth century. 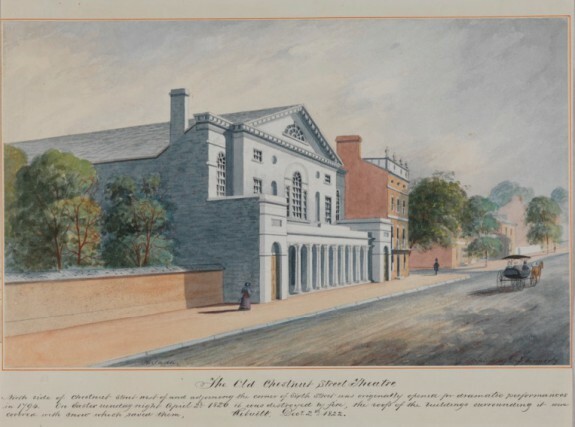 The Chestnut Street Theatre, originally called the New Theatre, opened in 1794 and was highly regarded as a beautiful work of art and architecture. At maximum capacity, about 2,000 patrons could enjoy the plays, ballets, and other live performances that graced its stage. In 1816 the theater burned down and a second Chestnut Street Theatre was built in its place two years later. 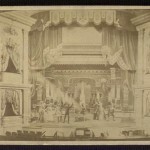 A fire destroyed the second theater as well and a third theater was built in 1862, a few blocks away from the original. More than a century after opening its doors, the theater closed in 1913 and was demolished. 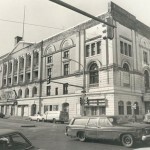 The corner of Broad and Poplar Streets has been home to Philadelphia’s Metropolitan Opera House, seen here in 1981. The building opened as the Philadelphia Opera House in 1908 and was the largest opera house in the world, with seating for more than 4,000 guests. By the 1920s the Met began showing silent films in addition to its theatrical productions, and by the 1940s it had been turned into a ballroom and, later, a sporting venue for basketball and wrestling. As the Francisville neighborhood grew and changed, the Met did not make the revenue it desired and the building was sold in 1954 and converted into a church, as well as a recording space for the Philadelphia Orchestra. By 1988 the building was in disrepair, but through the efforts of the Holy Ghost Headquarters Revival Center church group it was stabilized and partially renovated. As of 2015, further renovations to the Met building were halted and its future was uncertain as the congregation faced litigation with a developer. Philadelphia has a rich ballet history that spans centuries. Although initially not hospitable to dance, the city developed into an attractive destination for international ballet dancers and teachers and eventually produced the first genuine ballerinas born in the United States, the first thoroughly American ballet troupe, and one of the most prominent of the regional ballet companies that proliferated nationwide in the 1960s. Over the years, Philadelphians have welcomed many of the art form’s most storied practitioners to local stages. Philadelphia’s founder, William Penn (1644-1718), a Quaker who disavowed balls and shows as inconsistent with a temperate lifestyle, was among the early detractors of dance. Indeed, the “Great Law” that Pennsylvania’s first legislature adopted in 1682 included penalties for frequenting such amusements, and various bans against theatrical entertainments endured for more than a century, supported in principle by a number of religious denominations along the way. Nevertheless, rope dancers appeared from 1724 onward and dancing masters advertised regularly as early as the 1730s. Moreover, hornpipes, comic dances, and “mock” minuets often accompanied theatrical dramas, which surfaced despite all opposition. Soon after the legal prohibitions ceased in 1789, professional French dancers arrived via the Caribbean islands and introduced theatergoers to sophisticated hybrids of ballet and pantomime. These performers told stories using a codified set of movements and stylized gestures instead of words. The first French ensemble to alight in the city was led by Alexandre Placide (1750-1812), who early in his celebrated career had danced in popular Parisian theaters and for French royalty. After his ex-wife accused him of stealing from her and seducing her servant, Placide left France, working for a time in present-day Haiti and then coming to the United States, where he earned a reputation as an able theatrical manager. In Philadelphia and elsewhere, Placide and his troupe acquainted audiences with ballet-pantomimes such as The Old Soldier, about a veteran who rescues a young girl from thieves. During the 1790s, when Philadelphia served as the nation’s capital, its citizenry enjoyed a dazzling array of theatrical entertainments staged by Placide and other impresarios and featuring French, English, Irish, and Italian performers as well as the American John Durang (1768-1822), who owned a house on Cedar (South) Street. 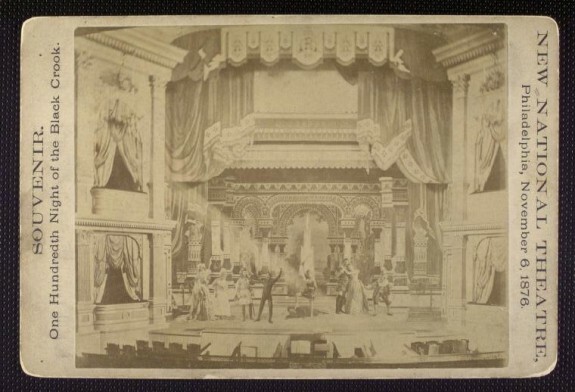 The New Theatre on Chestnut Street (opened in 1794 and commonly called the Chestnut Street Theatre) hosted many of these performances. Through the years, French émigrés also distinguished themselves as teachers. In the 1830s, P.H. Hazard taught young Philadelphians the dances being exhibited at that time by first-rate ballerinas at the esteemed Paris Opéra, where ballet, which originated in Renaissance court entertainments, continued to develop from the seventeenth century onward. Hazard himself had once been a member of the Paris Opéra’s corps de ballet. Due to his efforts, itinerant stars in search of supplemental dancers for their own performances found better ones in Philadelphia than in New York, which by then was the country’s artistic capital. 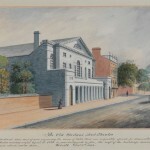 In 1837, two of Hazard’s protégées, Mary Ann Lee (c. 1823-99) and Augusta Maywood (1825-76), appeared together at the Chestnut Street Theatre. Both went on to enjoy distinguished, yet divergent, professional careers. Lee so enchanted audiences that she was known simply as “Our Mary Ann.” She danced to great acclaim in New Orleans, New York, and Boston before embarking to France for continued study at the Paris Opéra. After a year there she declared “…I much prefer my own dear country…” and returned home with improved technique and new ballets to perform drawn from the Romantic repertoire, which emphasized otherworldly plots and an ethereal style of dancing on pointe. On New Year’s Day, 1846, in Boston, she staged the American premiere of Giselle, one of the few Romantic ballets still produced in the twenty-first century. After retiring at about age 24, she taught, raised children, and supported her widowed mother. Maywood, too, left Philadelphia to study at the Paris Opéra, but, unlike Lee, she never returned. Instead, she danced on stages all over Europe, showcasing what the French critic Théophile Gautier (1811-72) called “[s]inews of steel, legs of a jaguar, and an agility not unlike that of a circus performer.” After one appearance in Florence, Italy, three carriages were needed to cart away all the bouquets tossed at her feet. Although more talented and accomplished than Lee, she was less beloved back home, criticized for her scandalous affairs and for abandoning her destitute stepfather. 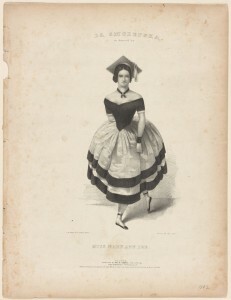 Nevertheless, Maywood became her nation’s first ballerina superstar, and, together with Lee, proved that America—indeed Philadelphia—could produce its own ballet dancers rather than simply import them. A third member of this cohort, George Washington Smith (c. 1821-99), partnered with Lee and virtually every other significant ballerina of the day, including the incomparable Fanny Elssler (1810-84) from Vienna. The manager of the Chestnut Street Theatre, where Elssler appeared in the 1840s, claimed she “…turned the heads of all the ladies and the hearts of all the gentlemen…,” yet it was Smith who apparently turned her head as he danced jigs between the acts of plays. Impressed with his talent, Elssler invited him to join her troupe. Smith learned ballet technique from Elssler’s Irish partner and became proficient enough to sustain a long career as America’s foremost danseur noble. During this period, theaters relied on gaslight for illumination and Romantic ballets especially were enhanced by its soft, haunting glow. Contact with open gas jets, however, led to theater fires around the country. The most tragic of all occurred at Philadelphia’s Continental Theatre, near Eighth and Walnut Streets, in 1861. It began when Ruth Gale (c. 1840s-61), one of four British sisters hired to dance in Shakespeare’s The Tempest, stood on a settee to grab her dress in an upstairs room as the play was underway. The dress grazed a gas jet and ignited, and the fire quickly spread from Gale to other dancers who rushed in to help. Eventually, about a dozen young women—including all four Gales—died from burns or injuries they sustained after leaping from windows to escape the flames. They were eulogized as virtuous and loving girls at a time when female dancers were often caricatured as disreputable, a small but important step in the long process of legitimizing the profession. Toward the end of the nineteenth century, ballet in the United States generally reached a low ebb. Romantic-era artistry had given way to acrobatic tricks, military marches, and spectacular stage effects. It was not until the early twentieth century that Philadelphians again saw ballet’s most fabled interpreters, then mainly Russian graduates of the Imperial Theater School in St. Petersburg. Anna Pavlova (1881-1931) arrived in 1910, followed six years later by the peerless Vaslav Nijinsky (c. 1889-1950), who performed the title role in Till Eulenspiegel, one of only four ballets that he choreographed himself. 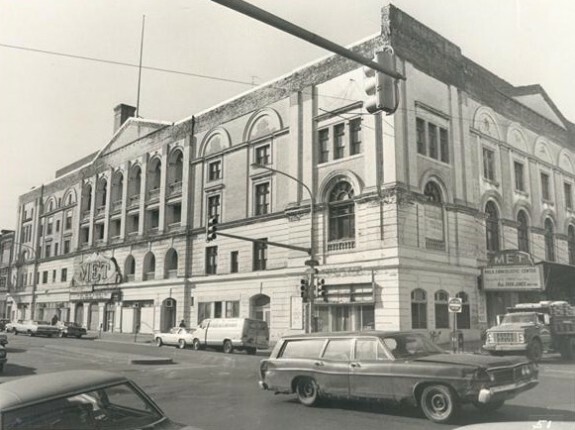 Both dancers appeared at the capacious Metropolitan Opera House at Broad and Poplar Streets. A third Russian, Lubov Egorova (1880-1972), retired from the stage and devoted herself to teaching in her Parisian ballet studio, drawing an international clientele that included a young Philadelphian named Catherine Littlefield (1905-51). With Egorova’s methods and artistry in mind, Littlefield trained students at her own school at 1815 Ludlow Street. Russian émigré George Balanchine (1904-83), arguably the twentieth century’s most important choreographer, thought so highly of Littlefield’s pupils that he recruited a number of them for his first ensemble in the United States, while others joined Ballet Theatre (now American Ballet Theatre) when it formed several years later. In 1935, Littlefield established her own company, the Philadelphia Ballet, and shortly thereafter staged the first full-length, full-scale version of The Sleeping Beauty in the United States, an undertaking that required 100 dancers, 85 musicians, and elaborate scenery and costumes. Like Mary Ann Lee before her, Littlefield introduced Americans to an iconic ballet that is still regularly performed. Littlefield also became well known for choreographing lively and humorous works with indigenous themes and characters such as farmhands, secretaries, and commuters. These ballets, notably Barn Dance and Terminal, delighted audiences and critics alike during the Philadelphia Ballet’s European tour in 1937, the first ever by an American ballet troupe. Long after Placide and Hazard brought French ballet to the United States, Littlefield took American ballet to France (as well as to England and Belgium). During this period, ballet, like most other aspects of society, experienced the limitations of racial segregation. The elegant and civic-minded Essie Marie Dorsey (1893-1967) directed the largest dancing school in the city patronized by African Americans. She occasionally arranged for Thomas Cannon (1910-77), a leading member of the Philadelphia Ballet, to work privately with her best students and had them perform at benefits, teas, meetings, and in opulent recitals. Marion Cuyjet (1920-96) and Sydney King (b. 1919) studied with Dorsey and became dedicated teachers themselves, with Dorsey’s positive and personal approach serving as an inspiration. Judith Jamison (b. 1943), longtime artistic director of the Alvin Ailey American Dance Theater, and Joan Myers Brown (b. 1931), founder of the Philadelphia Dance Company, or Philadanco, emerged from this important instructional network. Both used their early ballet training as a foundation for exploring a variety of dance genres and both received the National Medal of Arts, the highest award given to artists by the U.S. government. Of the same generation as Brown, Barbara Weisberger (b. 1926) studied with Balanchine as a child and then at Littlefield’s school as a teenager. With Balanchine’s encouragement, she started the Pennsylvania Ballet in 1963, filling a void left by the demise of Littlefield’s company in the early 1940s. Significant grants from the Ford Foundation provided early financial stability and the Pennsylvania Ballet became a leader in the regional ballet movement that flourished in the 1960s, when professional troupes sprang up in cities and towns around the country. In the ensuing decades, however, fiscal troubles emerged periodically and in 1987, the company arranged with the Milwaukee Ballet to share a budget and roster of dancers while maintaining separate staffs and orchestras. This novel partnership proved untenable and dissolved two years later. In 1991, a suspension of operations was averted when artistic director Christopher d’Amboise (b. 1960) spearheaded a dramatic “Save the Ballet” campaign, which raised $1.2 million from more than 10,000 individual contributors. Roy Kaiser (b. 1957), who joined the company as an apprentice, succeeded d’Amboise and provided steady leadership for nearly two decades, his tenure capped by the organization’s fiftieth anniversary celebration. In the meantime, two Pennsylvania Ballet-connected dancer/choreographers, Christine Cox (b. 1969) and Matthew Neenan (b. 1974) founded BalletX, an ensemble based at the Wilma Theater and dedicated to producing new work in a contemporary style. 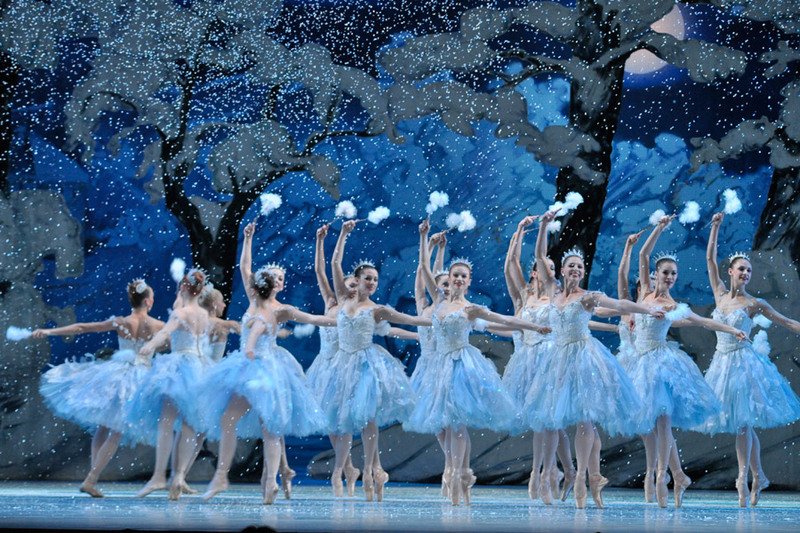 BalletX’s diverse and modern offerings, combined with the 2014 naming of Angel Corella (b. 1975), a world-renowned dancer from Spain, as Pennsylvania Ballet’s new artistic director, signaled that Philadelphia would continue its long tradition of attracting high-profile talent and attention. Sharon Skeel is a Philadelphia-based dance writer and lecturer currently working on a biography of Catherine Littlefield. Her essay on Littlefield’s 1937 production of The Sleeping Beauty was published in the Summer 2015 issue of Ballet Review. Barzel, Ann. “A Portrait of Catherine and Dorothie Littlefield.” In Dancing Female: Lives and Issues of Women in Contemporary Dance, edited by Sharon E. Friedler and Susan B. Glazer, 23-44. Amsterdam: Harwood Academic Publishers, 1997. Brooks, Lynn. “A Decade of Brilliance: Dance Theatre in Late-Eighteenth-Century Philadelphia.” Dance Chronicle 12/3 (1989): 333-65. Brooks, Lynn. “Against Vain Sports and Pastime: The Theater Dance in Philadelphia, 1724-90.” Dance Chronicle 12/2 (1989): 165-95. Brooks, Lynn. “Dancing Masters in Eighteenth-Century Philadelphia.” In Dance: Current Selected Research, edited by Lynnette Y. Overby and James H. Humphrey. Vol. 2, 1-21. New York: AMS Press, 1990. Brooks, Lynn. John Durang: Man of the American Stage. Amherst, New York: Cambria Press, 2011. Costonis, Maureen Needham. “Ballet Comes to America, 1792-1842: French Contributions to the Establishment of Theatrical Dance in New Orleans and Philadelphia.” Ph.D. diss., New York University, 1989. Dixon, Melanye White. Marion D. Cuyjet and Her Judimar School of Dance: Training Ballerinas in Black Philadelphia 1948-1971. Lewiston, Queenston, Lampeter: The Edwin Mellen Press, 2011. Dye, William S. Jr. “Pennsylvania versus the Theatre.” The Pennsylvania Magazine of History and Biography 55/4 (1931): 333-72. Gottschild, Brenda Dixon. 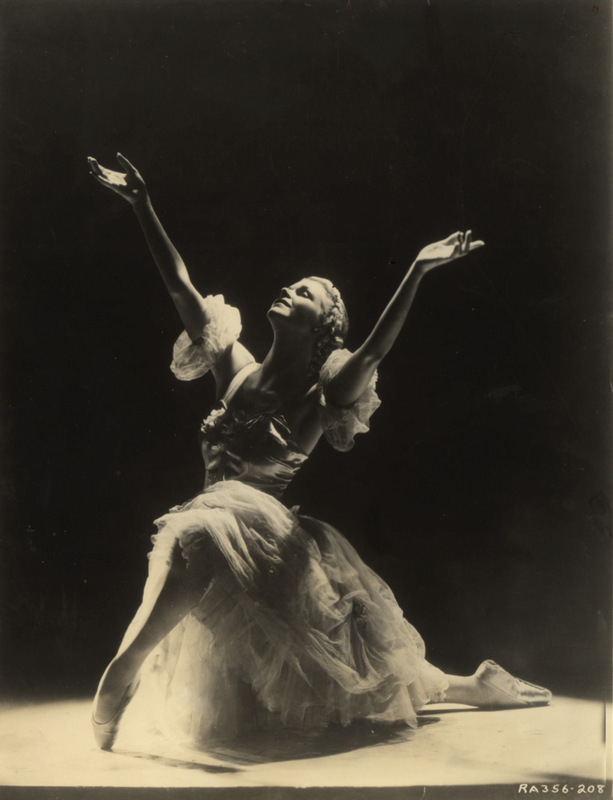 Joan Myers Brown and the Audacious Hope of the Black Ballerina: A Biohistory of American Performance. New York, London: Palgrave Macmillan, 2011. Homans, Jennifer. Apollo’s Angels: A History of Ballet. New York: Random House, 2010. Magriel, Paul, ed. Chronicles of the American Dance: From the Shakers to Martha Graham. New York: Da Capo Press, 1978. Martin, Christopher. “Naked Females and Splay-Footed Sprawlers: Ballerinas on the Stage in Jacksonian America.” Theatre Survey 51/1 (2010): 95-114. Maynard, Olga. “Barbara Weisberger and the Pennsylvania Ballet.” Dance Magazine, March 1975: 46-59. Swift, Mary Grace. Belles and Beaux on Their Toes: Dancing Stars in Young America. Washington, D.C.: University Press of America, Inc., 1980. Swift, Mary Grace. “Dancers in Flames.” Dance Chronicle 5/1 (1982): 1-10. Wemyss, Francis Courtney. Twenty-Six Years of the Life of an Actor and Manager. Vol. 1. New York: Burgess, Stringer and Company, 1847. American Theatre Playbill Collection, Library Company of Philadelphia, 1314 Locust Street, Philadelphia. Cartes de visite of Female Dancers, Harvard Theatre Collection, Houghton Library, Harvard College Library, Harvard University, Cambridge, Massachusetts. Catherine Littlefield Scrapbooks, Jerome Robbins Dance Division, New York Public Library for the Performing Arts, 40 Lincoln Center Plaza, New York, New York. Collection of Academy of Music Programs, Playbills, and Scrapbooks, Historical Society of Pennsylvania, 1300 Locust Street, Philadelphia. Philadelphia Dance Collection, Special Collections Research Center, Samuel L. Paley Library, Temple University, 1210 Polett Walk, Philadelphia. Theatre Collection (Rare Book Department) and Dance Files (Music Department), Central Library, Free Library of Philadelphia, 1901 Vine Street, Philadelphia. Metropolitan Opera House (no longer used as an opera house), Broad and Poplar Streets, Philadelphia. Wilma Theater, 265 S. Broad Street, Philadelphia. Bravo, Sharon. You did a great job of cogently summarizing several hundred years of Philadelphia’s ballet history in one essay.